Talk about an easy good deed. 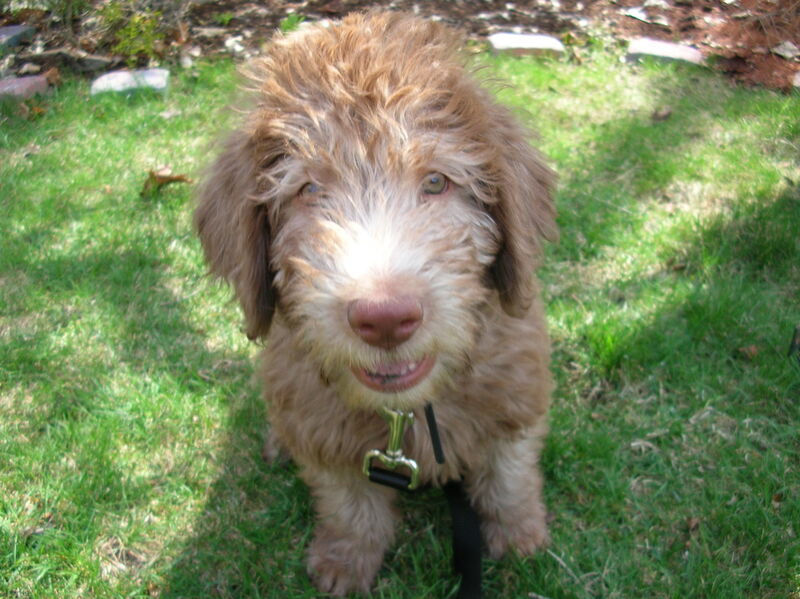 I sat at my computer, clicked on a lot of super-cute furry faces, and voted for all the dogs I wanted to kidnap and take home immediately. There were many. If your pet was raising one furry little eyebrow, doing the irresistible doggy head tilt or just gazing with please-pick-me in his eyes, he got my vote. Suffice it to say, Fido’s donation for guide dogs spiked considerably. P.S. Sincere apologies for the stinky-bad pun in the title of this post. If you have something better, please share (and if you have something even stinker, that’s fun too!). Ka-ching! Do you support charities? Of course you do, if you fit the average Canadian profile. More than eight out of 10 of you have given cash to a good cause within the past year. Ever wonder if your money actually makes it to the people who matter? MoneySense has the answers – at least some of them – on its personal finance website. Check out its just-released chart that rates 100 well-known charities on their “efficiency.” We all understand you gotta spend money to make money. But which non-profit organization is spending six bucks to raise a hundred, and which is spending almost sixty? How much of the money these agencies raise actually gets poured into programming? One caution: Some groups may not look so good on paper because they’re saving up funds now to flow into research projects later. The MoneySense editors recommend you use the chart only as a starting point. If you have questions, talk to the charities directly. Now if you’ll pardon me, I’m off to check on my charities. It feels a little like checking my funds on the stock market. Except a bear market could be a really good thing… if you’re talking about a non-profit nature conservation group. I Called for My Pipe? Yesterday morning we were recipients of an act that was both good deed and health hazard. Here’s the backgrounder: On the weekend, my family and I spotted a couple of pieces of tobacco pipe littering the sidewalk near our house. Actually, we didn’t know just what it was initially. The bowl of the pipe, on first glance, strongly resembled a chestnut – not such an unusual thing to find on the ground. But then we found the pipe stem a few feet away and pieced it together (little pun). Although I can say with confidence that we’ve previously seen more chestnuts than pipes around these parts, it’s not such a wacky find. We do live in the city, and on the archeological puzzle that is our block I’ve cleaned up lost gloves, a child’s building block, a trampled pair of prescription glasses and some items too unmentionable to mention (hooray for disposable gloves). I regret to say that I didn’t immediately scoop up the pipe parts. I could tell you we were embarking on a family walk and didn’t want to carry the litter around with us. But that’s a sorry excuse. By the time we got home again, I’d conveniently forgotten all about it. So what happened yesterday? I walked out the front door in the morning to find a gift waiting on one of our patio chairs: It was the pipe, fully assembled. Some passerby had picked up the parts, thoughtfully put them back together and placed the pipe where we’d be sure to see it. All the while assuming, of course, that I – or my husband, or my little girl – is some bereft, heavy-duty smoker. Sure, the good-deed-doer was enabling a bad habit. But his or her heart was in the right place, even if my lungs were not. In 50 Good Deeds news, I now have a Facebook fan page. Please be sure to visit and click “Like” (if we get enough of them, my page gets to play with the bigger pages!). And if you happen to pick up the summer issue of Best Health magazine, turn to pages 32 and 33 for a recap of the editors’ first-ever Blog Awards and a profile of the winners, including moi. Enjoy… and tar the roads, not your lungs. If you spend much time taking public transit, you’ve seen billboards and bus ads meant to make you shop, travel, go back to school or get your teeth whitened. How often do you see one that makes you feel uplifted? 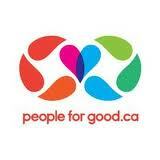 I first noticed a People for Good ad while waiting on a subway platform, and was intrigued and thrilled. (Never mind that, just a few feet away, some stumbling drunk was relieving himself into the train tunnel. True story.) Point is, here was a beautiful, eye-catching ad representing a significant effort to tell our entire city how delightful it is to do good. Awesome – let’s all get sticky. Although about a kadzillion people have been named on the website as having contributed toward this nationwide campaign, the two key Canadians who sparked it are Zak Mroueh and Mark Sherman. Both men work in media and communications. And yes, they pulled in a few professional contacts to pull this off. They’ve also been overwhelmed by the positive public response. There have been articles, radio programs, TV spots. The word is spreading. The good-deed ideas are catching on. “We’ve heard stories of people ‘high-fiving’ the transit posters,” says Zak, adding wistfully that he’d love to see that firsthand. Sounds ambitious, doesn’t it? But it feels so darn good. First, let me say that I am not secretly shilling for a coffee company. No one pays me to write the stuff on this blog. And I’m not expecting a case of free java in exchange for today’s post. During each thirty-second spot, you watch a video of an inspiring person. In one, it’s a happy little girl with springy curls in front of a mirror, doing the best personal affirmation I’ve ever witnessed. In another’s it’s an honest homeless man whose life changed for the better after he returned a lost wad of cash. Sure, we saw some of these go viral on YouTube long before they were ever associated with the joe. But add in the mood music, and you’ll get a couple of tears out of me every time. You can watch all six ads on the company’s Brew Some Good website. But no need to wean yourself from optimism breaks after that. On the site, ordinary people are encouraged to upload and share their own optimism, in the form of personal photos, stories and videos. Other visitors can rate these submissions according to whether they perk them up (Ha ha, get it? “Perk”? I’d ROFL, but I haven’t vaccuumed in a while). Fun Friday news: 50 Good Deeds has won an Irresistibly Sweet Blog Award. As far as I can figure, this is some kind of chain mail of blog recognition. Sweet blogs are acknowledged, rules are followed, the award is passed on to other worthy bloggers. 1. I adore my family, my friends, my perennial garden plants… usually, but not necessarily, in that order. If one of them bugs me, they’re sent to the back of the line. 2. I have a printout of “The Optimist’s Creed” taped beside my desk. 3. I have a rather dark sense of humour. That’s all I’ll say about that. 4. I love, love, love Japanese food. Then again, I love food, period. 5. I intensely dislike putting away groceries. I would gladly clean five toilets to avoid this kitchen chore. 6. I’m better than average at reading people. I don’t always let this on. Why should I? So if you’re lying, insincere or hiding a dark secret, be warned. I’ve totally got your number. 7. I make my living writing non-fiction, but I’m a closet novelist, closet playwright, closet poet and closet children’s writer. I hope one day to come out of the closet. 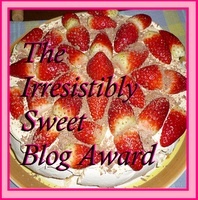 The third and final rule is to pass the Irresistibly Sweet Blog Award on to other bloggers. This part is easy; I know lots of sweet people, sweet writers and sweet blogs. But for the sake of these selections, can we assume “sweet” means excellent, as in “You bought me a car? Sweet!” and not sweet as in “Aw, who’s a sweet widdle puddy tat?” Because otherwise, this could get condescending and weird. 1. Great Things about Being Blind: The title is self-explanatory and the blog is often very funny. Storyteller Kim puts up a new post every day. 2. One in 36 Million: My friend Melanie, a single mom, writes poignantly about life and other adventures with her son. 3. Inclusive Humanity: My colleague Krista writes from the heart – as well as from a slew of professional experiences – about the value of including people of all abilities in our community. 4. Letters from Rona: I do enjoy author Rona Maynard’s writing and I’m sucked into her stories without fail, even when I have more pressing things to do. 5. Literary Type: Professor Sarah is honest, introspective and pretty darn interesting if you’re the bookish sort (which I am, of course). Enjoy the blogs; enjoy your weekend. A caring videographer from California has made it his business to meet invisible people and turn them visible. And now his efforts have helped a homeless Canadian find a place to live. For two and a half years, Mark Horvath has interviewed and filmed dozens of homeless people and shared their stories on his video blog (or “vlog,” as the young kids are calling it these days). Not long ago he posted a clip about Donny, taken on a freeze-your-face-off night in Calgary. In the video, Mark, who once lived on the streets himself, appears gobsmacked that Donny’s planning to sleep outside in an alleyway on sheets of cardboard. “It breaks my heart,” Mark says. Mark, if by “mess you up” you mean “make you want to hug someone,” then your warning is apt. People: watch his videos. P.S. It’s my anniversary (sort of)! The first day of May marks five years since I started my good-deed-a-day project. I’m sending thick slices of virtual cake and gaudy party hats to all the readers and subscribers who visit this space and keep the theme going. Bonne fête!